Central Bank of Liberia (CBL) Executive Governor, Dr. Joseph Mills Jones has rejected claims in some quarters that the institution was wasting government money under CBL’s Micro-Finance Loan Scheme across the country. “We are not throwing money away, but investing in the future of the country. 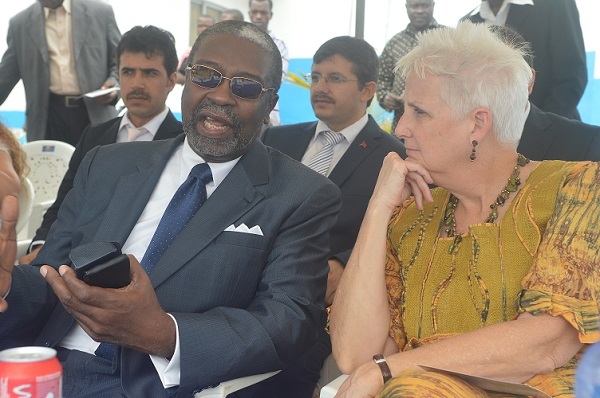 Moreover, there is nothing wrong with helping Liberians in order to improve their living conditions,” he pointed out. Governor Jones made the statement Saturday in Buchanan, Grand Bassa County when he addressed a joint ceremony comprising the Federation of Road Transport Union of Liberia (FRTUL) and the Citizens Progressive Moment Saving and Credit Union (CPMSCU). He said poverty alleviation is the goal of President Ellen Johnson Sirleaf’s administration; therefore, the CBL’s loan program was buttressing the government’s efforts in fighting poverty. He stated that one best way to fight poverty is by empowering Liberian citizens significantly, especially at all levels. He informed the audiences that the CBL was working with 38 Village Saving Loan Associations and Credit Unions, with an overriding objective to empower the people. “It is not a game for giving handouts to people. It is about giving people a helping hand in order to have something to work with in helping themselves,” he pointed out. He encouraged Liberians to invest in agriculture, adding that farming is very significant for a developing nation, especially in boosting its economy. “Investing in the land is very important. Other countries you see today help their people to invest greatly in their lands. “Development is not a project. Development comes from increased production and increased productivity. Development comes from being able to create wealth. We must produce and do it significantly,” the CBL Executive Governor stressed. He said, “we need to develop ourselves through businesses, adding that this can only come by giving Liberians access to credit as means of building the private sectors. “It will not happen by talking or playing politics. It will happen by actually doing something. By putting our people to work in the private sectors if we are to move from a low income to a middle income country,” Dr. Jones emphasized. He maintained the CBL’s determination to “continue to be a friend of the private sectors by continuing to empower citizens in the interest of the Liberian economy. The CBL’s initiative nationwide has been highly embraced by beneficiaries, especially in the rural areas as was evidenced by the enthusiastic welcome given Dr. Jones and entourage to Buchanan on Saturday.